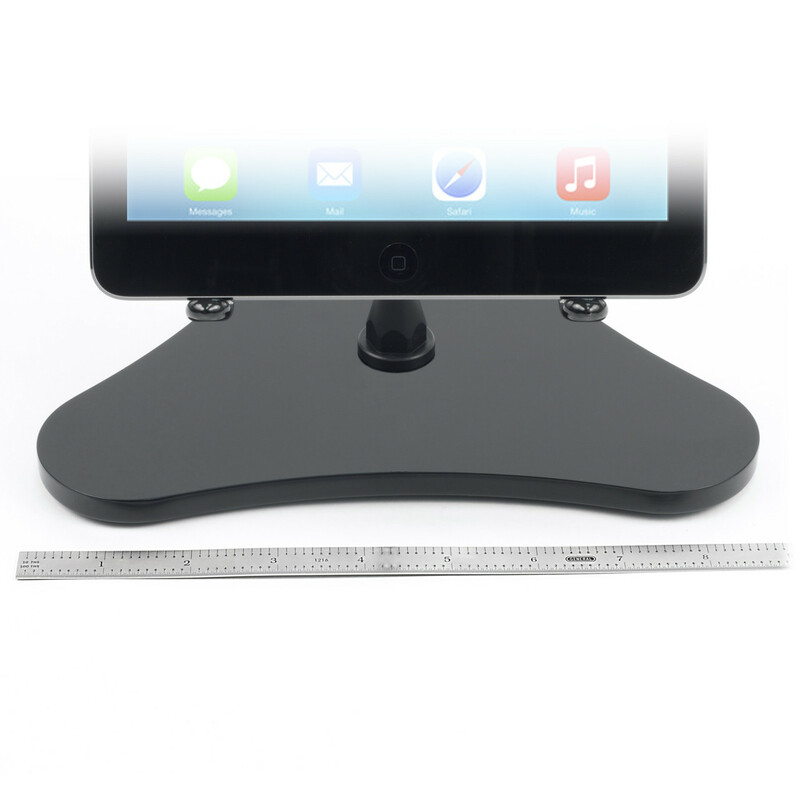 iPad stand with full pivoting, that is adjustable to your case and portable. 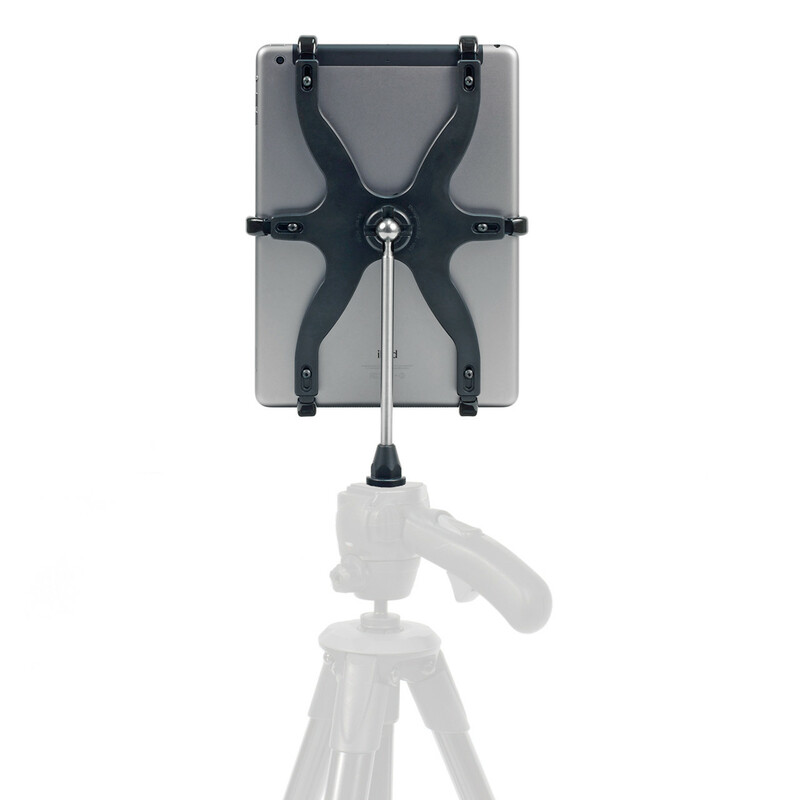 While being very easy to use with or without a case, the stand is more than just one stand. Designed to be separated from the Planet Base, and then the holder and pivoting ball shaft can be mounted to any tripod. These premium features make this, the best iPad stand for you. Shoot like a pro with photography, self-portraits and videography! 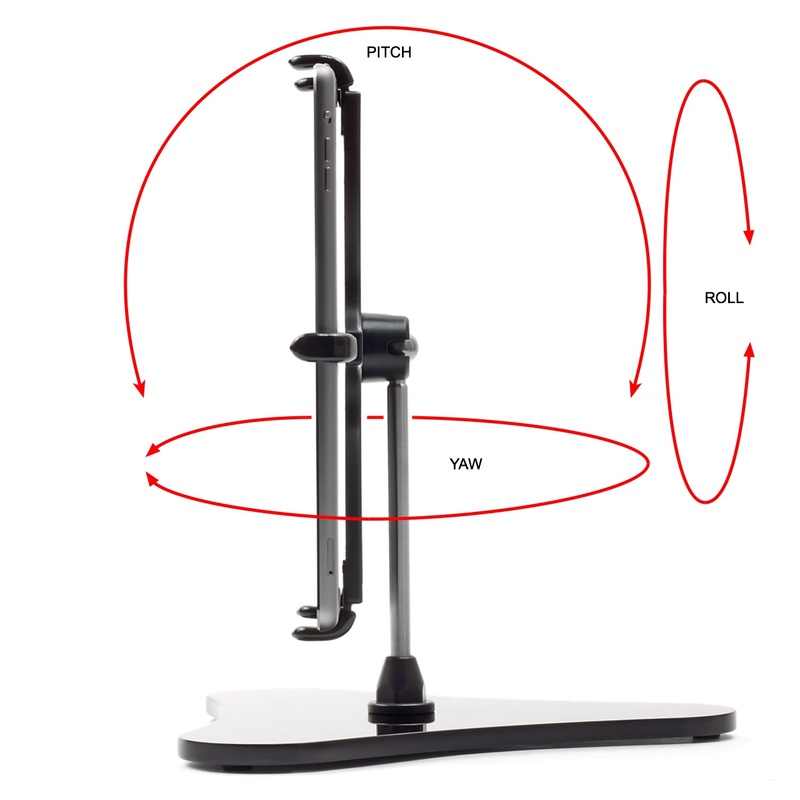 The PED4 Planet IPA10 iPad stand has user configurable fingers that creates a snap like fit to hold the iPad. These fingers allow the mount to be used with or without a case efficiently, while securely holding the iPad as your hand would. 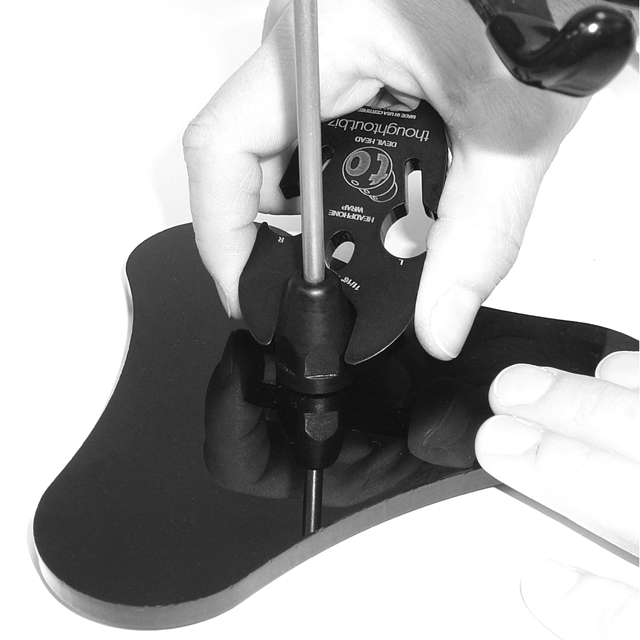 Once the holder is configured to your desired fit, there are no special procedures needed, the iPad installation and removal is instantaneous. All of the controls, ports and camera are fully accessible at all times. The impressive characteristic design features of the PED4 Planet IPA10 will have you astonished. The 8-3/4" Planet base is a well suited size to precisely balance the iPad with the center of gravity, the stand will not tip over. The attention to detailed parts will make you realize why this is the best stand for your iPad. The premium quality, adjustability and portability of this iPad stand will be noticed the moment you place it on your desk and then used every day. While web-surfing, watching video or reading an email you will quickly see that the sleek shape of the Planet Base takes up very little space and can be placed in any corner of your work space or counter top. We guarantee you will use and miss it when you don't have it around. Proudly made in Connecticut, USA from solid stainless steel, alloy, polymer and heat resistant polymer materials. Designed for iPad Pro 10.5 - 9.7, iPad Air 2 & iPad Air with or without a case, skin, bumper or protective cover. Also works iPad 4g, 3g and 2g with available Extension fingers, these will allow more room for a case or skin too. 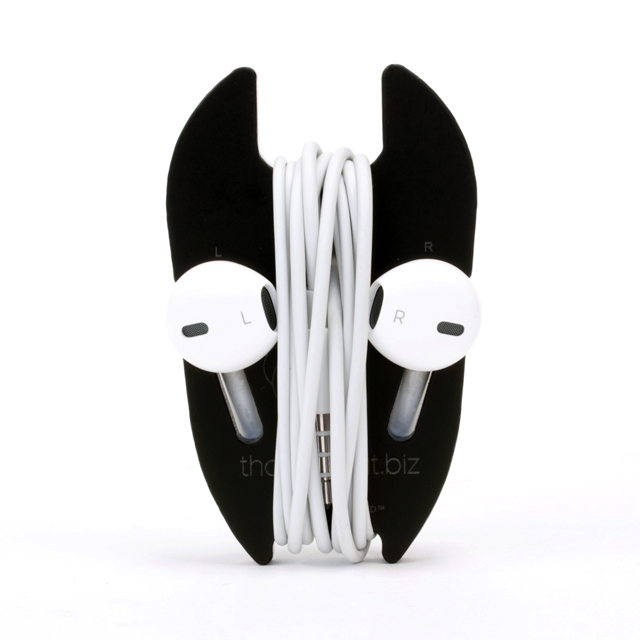 Devil Head - Headphone Wrap and Wrench or simply use your own 11/16" open ended or adjustable wrench. Adrianne "This looks so safe, I always kind of doubt the other products designed to place a tablet like this, but this specific one seems to really hold the ipad in a steady manner, I really like it." Lamarr Wilson "FABULOUS iPad mini Stand....Video"
Brian Byrd's Photo Blog "it took only a couple of days of using it before I was wondering how I had ever lived without it!" Resting Height of Device (Landscape): Approximately 4"
Support Shaft: Stainless Steel ø.313 x 6"
I really like how this stand pivots as I use it on a island counter top and I can just " flip it around" to whatever angle I want without having to move the whole stand. The only thing that would make it " better" would be if the pole height was adjustable i.e. telescoping. Sometimes I'm sitting and sometimes I'm standing. I also like how I can leave the case on my IPad Air and it will still fit in the "fingers". Nice customer service with prompt turnaround response time. WONDERFUL PRODUCT WITH GREAT STYLE AND APPEARANCE!!!!! I have the Zagg slim book case/keyboard. With this set up the case/iPad is magnetically held to a hing attached to the keyboard so that the case/iPad can be seperated easily. Having the PED4 Planet IPA10 iPad Air Stand Pivoting is a phenomenal piece to now own. I travel all week long and it is great to be able to take this stand anywhere I am at, set my key board down, seperate the case/iPad from the keyboard, and snap it into place on the stand. It is at the perfect height for viewing anything that I need to look at on my iPad instead of looking downward as is the situation when using any tablet keyboard/case. The strain on my neck is no longer there with having this stand. As always, ThoughtOut has great innovative designs that bring far better use of our mobile devices. Having worked with Mike Talmadge in the past through my Sales/Manufacturing connection to him and using several of their products for a number of years now, he, his wife, and his partners are great people. If you ever have any questions or problems you can always rely on a response from them. He covers things very well on his web-site so if you take the time to read and educate yourself you shouldn't have to contact him often. Great company owned by wonderful people with phenomenal products!!!!!!!!! It hold my IPAD Air with case ok but it swivels too easily and if I want to press my screen to go to something else (like email to google) I have to hold the top or it just swivels all over. Nice height though. THOUGHT OUT COMPANY NOTATION: Thank you for your review. Please refer to the instructions included with the product (item 4) on how to make an adjustment to the ball socket which will correct the issue described above. Had searched for over two months for an acceptable holder for the iPad Air 2 without success. Purchased several, in each instance, the unit was too large, too bulky, too cumbersome or just impractical for easy use. The PED4 easily comes apart to fit into a briefcase, yet sets up in less than a minute and is sturdy and holds the iPad securely. After trial and error with other products, I have finally found the best on the market. Don't feel you can go wrong with this product but, should you find you have an odd-sized case for your iPad, talk to the folks at "ThoughtOut." They're reasonable, friendly and down-right nice people! I travel the country recruiting graduate students for Vanderbilt University. This iPad stand is just what I wanted so students don't have to bend over the table to enter their information into my iPad. To my great surprise, it comes apart in two pieces and will easily fit right inside my carryon suitcase. So happy with my purchase! Marginal holding power with larger/thicker ipad cases.